Here’s a crackling combination that combines Gemini’s insatiable curiosity with Aries’ need for challenge. They’ll create a fast-moving relationship that thrives on what’s new, as they jump from one adventure to the next. Sun in Gemini is focused on everything. If this sounds like an exaggeration, consider that Gemini is the sign of information and options. He has a continual drive to assimilate new ideas, compare them to what he knows, and then move on to the next. A less evolved version of this Sun sign can treat his partners in the same way. But a partner who continually engages him with new ideas should be able to keep (an evolved and aware) Sun in Gemini happy. 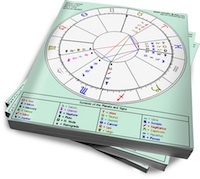 His partner must also have a high (or non-existent) jealousy threshold; Sun in Gemini will have an endless stream of friends and acquaintances, of both sexes. Each new person he meets is fascinating—for a little while. Moon in Aries needs to feel that she’s up against something. Whether it’s a partner who challenges her or a goal that seems impossible, she feels satisfied when she has something to prove. Emotionally, she’s a fast mover with no patience for games. A partner who alternately pushes back (when she loses her temper) and backs off (when she needs her space) will suite this volatile Moon. Moon in Aries is not domestic; she finds routine stifling and shows her love with fiery displays of passion and anger. However, her partner should be aware that when she gets bored, she’ll pick fights for no reason. What these two share is the need to keep things fresh. Moon in Aries will fire up Gemini’s curiosity, pushing him to check out situations/ideas that he may never have considered. Sun in Gemini will keep Aries satisfied with his constant stream of new projects, friends and goals. Between shared adventures, each will be happy to let the other go off and do their own thing. The only problem with this combined energy is its lack of stability. Neither sign is known for its staying power, so some strong Saturn contacts between the charts would be helpful for a long term relationship.